Utagawa Yoshitora (active 1850-1880) Okubi-e Portrait of the Actor, Nakamura Shikan, c. 1869. Oban. Where to start with this stunning portrait of the actor Nakamura Shikan? Since the artist is Yoshitora and it is an okubi-e the obvious conclusion is that the print forms part of the extraordinary series that Kunisada conceived as his swan-song in the late 1850’s, early 1860’s, ably assisted by Yoshitora... except that it isn’t. It is tempting also to ignore the signature and say that in style, finish and border design that this must be from Kunichika’s later series of okubi-e that rival Kunisada’s outstanding achievement… except this print is not by Kunichika and so it cannot be that. The print, although previously unrecorded seems to be that rare thing: a missing link. Stylistically and in terms of date, this outstanding and extraordinary print appears to connect Kunisada’s mighty series and that of the only other oban okubi-e prints of the century, those of Kunichika, begun in 1869. Okubi-e (large head portrait prints) are generally credited to the artist Katsukawa Shunko I (1743 - 1812); other artists excelled at them among whom Utamaro and Toyokuni I are outstanding. The format was banned by the shogunate in 1800 for around a decade but then started to creep back in popularity. 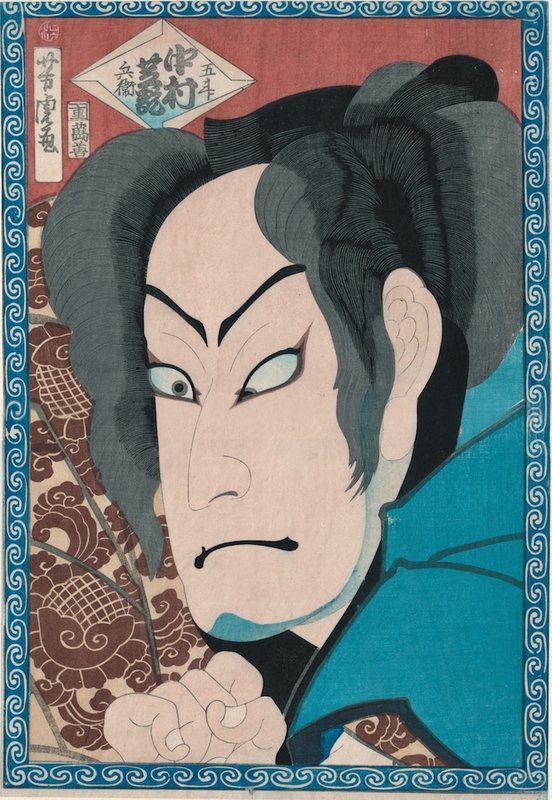 This series by Kunisada and Yoshitora revives the tradition but with the cropping of the margin even closer to the subject, making a greater visual impact. As mentioned above, although frequently ignored, Osaka artists were frequent visitors to Kunisada’s studio and indeed pupils. Yoshitora’s contribution to the series cannot be underestimated. His twelve prints are all outstanding and benefit from the same dazzling quality of production as Kunisada’s. This print then is an anomaly. Definitely not part of the Kunisada series, Actor Portraits Past and Present nor seemingly part of any other series, the print appears to stand on its own. I am not aware that Yoshitora carried out any further okubi-e prints after the end of the Kunisada commission. What surprises me more is how close this print is in style and production to that of Kunichika’s later series… it is tempting is it not, to imagine that Yoshitora was somehow involved in Kunichika’s series of later in the decade? Well, that is all supposition I am afraid. The print is full size and completely outstanding. Colour, impression and condition are all very fine… the print is pristine, almost perfectly preserved in fact. An important print formally, it seems to me that the piece carries the stylistic innovations of the first part of the century into the later Meiji, a period that was characterised so much by bolder forms and colours. I think this is an important and culturally outstanding artefact.